Japan’s All Nippon Airways (ANA) will launch the next phase of its “Tastes of Japan” campaign in September to highlight the cuisine of three more of the country’s prefectures. 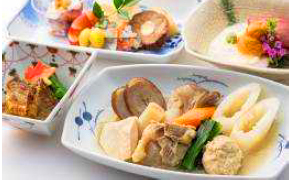 The airline will offer Akita cuisine to its international Business Class passengers during the latest phase of the campaign. A main dish of Hinai-jidori chicken, revered as one of Japan’s three tastiest local chicken brands, will be served in the classic Akita specialty of kiritanpo nabe or skewered mashed rice hot pot. At “DINING h” restaurant inside the ANA SUITE LOUNGE at Haneda Airport (HND), an October highlight is beef filet and foie gras sauté with “Fukura” French toast in blueberry sauce. Fukura refers to a spicy French toast-style dish made from Akita tofu, which pairs well with the sautéed meat and vegetable side dish that will also be offered. The Saitama prefecture will be featured during November at “DINING h” restaurant with “Musashi wheat-fed pork loin,” fried in onions and ginger. A delicacy of late fall, this pork is renowned for its delectable balance of rich red and sweet fatty meat, prepared in the classic ginger-fried style. The prefecture's cuisine will also be represented at the ANA SUITE LOUNGE at Haneda and Narita Airports (NRT) by gourmet onion bread made with wheat grown in Saitama. Dough created from this wheat is kneaded with onions, black pepper and coarse-grained green pepper, then baked. 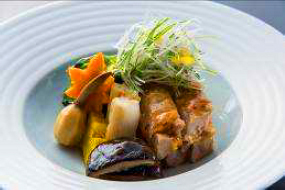 ANA's international First Class passengers will be offered cuisine from the Shimane prefecture. 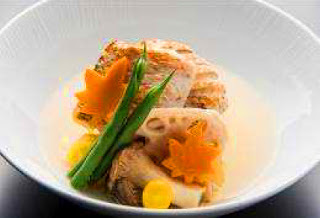 Dishes include fried tilefish caught in the prefecture, paired with sautéed abalone and flavored with garland chrysanthemum puree and olive oil. The prefecture's cuisine will also be featured during September at the “DINING h” restaurant inside the ANA SUITE LOUNGE at Haneda Airport, including rockfish harvested from the waters of Shimane Prefecture prepared in a sauce of seaweed salt from the Hamada region. The rich fatty meat of the rockfish is fried in mellow salty sauce marketed under the Hamamori brand.